Jeff's career in golf administration began in 2003 as an intern with the SCGA. He is the leader of the Association’s tournament program and serves as the staff person in charge of the SCGA Amateur Championship and the California Amateur Amateur Championships when played in Southern California. He also oversees the SCGA rules education program, which includes seminars and workshops for members and Rules Officials and the production of the Rules Crew and Know The Rules video series. He has served as a Rules Official at numerous USGA National Championships and has achieved the highest level of rating on the USGA/PGA Rules exam every year he has taken it. Jeff lives with his wife and two children in Moorpark, CA. His interests outside of golf include travel, good food, wine and lots of laughs! What has been your favorite SCGA Tournament experience? "There are way too many to recollect; however, one I know I’ll remember when this is all over is watching an intern accidentally drive his golf cart into a lateral water hazard while “quickly” painting the hazard line. The next best part was watching him wade back into the lake after I told him he had to retrieve the hole location sheet that was still on the steering wheel!" 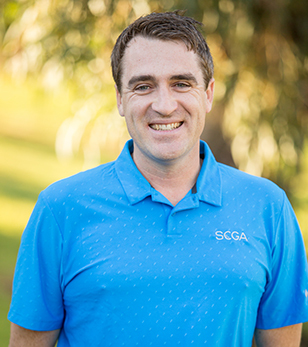 "My favorite part about working at the SCGA is that I’m connected to my passion and the game I love every day. Running tournaments and teaching the Rules of Golf allows me to work at various places with various people involved with this great game." Contact Jeff Ninnemann at: jninnemann@scga.org.